“The west side of Willsboro Bay is one of the most impressive landscapes on Lake Champlain.” A Kayakers Guide to Lake Champlain, Frank & Holden (2009) Black Dome Press. 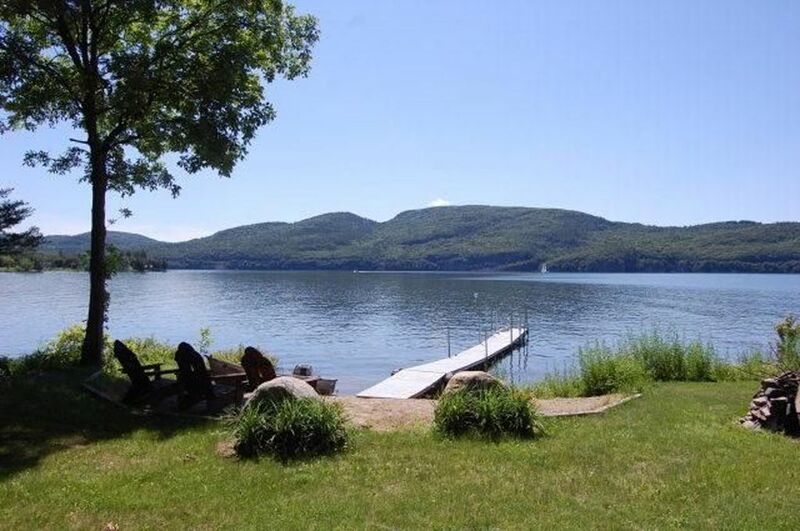 The beauty of Willsboro Bay, perhaps the best kept secret on either side of Lake Champlain, is right at your door. A wall of windows offers spectacular views of the water, the pristine western shore with its palisades, and 120 feet of your own private beach. This is a uniquely comfortable lake house, perfect for family vacations, romantic getaways, or to reconnect with nature; offering all of the amenities you crave with a touch of elegance yet still feeling like a traditional Adirondack camp. Enjoy two private master suites, making this property an ideal shared vacation site. A third bedroom offers a queen and distance from the other bedrooms. A fourth bedroom includes two extra long twins with its own door right onto the waterfront yard; privacy, views and all. Each bedroom is fitted with new premium bedding. Numerous windows, skylights and ceiling fans make the most of lake breezes. Cooks are treated to the full advantages of the house and views whether at the well-stocked granite-countered kitchen or the state-of-the-art barbecue. A dish washer, two refrigerators, microwave oven and toaster able to handle even larger rustic bread slices help make an especially pleasant experience for the cook. Three and one half bathrooms and a washer and dryer add convenience. There is plenty of space for socializing, dining, and relaxing. Smart TVs, satellite and high-speed internet offer entertainment and connectivity with the outside world. Three gas fireplaces add a perfect touch for cozy or romantic evenings during cooler weather. Unique furnishings provide both charm and comfort. Sun lovers will enjoy the west facing windows, two large decks, and private sandy beach for gloriously sunny afternoons and spectacular sun sets. But you can also catch sunrise when it’s reflected off of the palisades across the bay or on the large east facing deck outside the front door. Enjoy swimming, kayaking, and boating, with dock and mooring. Hiking, antiquing, Museum of the Underground Railroad nearby. Fire pit by the water and plenty of outdoor seating. Lawn space for badminton, bacci or frisbie. Hummingbirds frequent the front garden and feeders. The American bald eagle is a frequent visitor, and fish abound along with deer, myriad ducks and wild turkeys. Enjoy a walk or ride your bike down the miles of flat, quiet road that run the length of the bay out to the point where a public path through shade trees brings you out to the mouth of the bay and the grandeur of the great lake with its vista across towards Burlington and the Green Mountains of Vermont. Or visit one of the two marinas that lay nearby along the road, one slightly up the bay the other slightly down the bay. One has a pleasant affordable restaurant; the other caters to those seeking a more refined though more expensive palette. A few short miles from the house are the amenities of Willsboro which include Turtle Island Cafe - a wonderful restaurant, Ethel's Dew Drop Inn - a local ice cream and road side food stand, and the public library. Only a few more minutes by car is the quaint town of Essex, NY where there are shops, restaurants, an ice cream shop, an inn and one of the three ferries on the lake that can take you and your car across to Vermont and back. A few minutes drive beyond Essex is the Dogwood Bakery in Wadhams which boasts wonderful breads and once a week some of the best pizza on the entire lake. We have been coming up to Lake Champlain for years, staying with friends on the NY side and camping or renting a house on the VT side. We have paddled many spots on Champlain. Loving sailing along the shores of New England we have even sailed the 100+ mile long lake via a 2 week bareboat charter. We even held our wedding on the shores of the lake. Ultimately we knew we would buy a place of our own on Champlain. When we came across a truly wonderful property with a truly wonderful home on our favorite part of the lake, in our eyes the most beautiful part of the lake, there was only one possible decision. Your own private beach with gentle, sloping access to the beach, dock and water. Easy launch of kayaks. And a view of a parade of sailboats and the pristine shores across the bay. Views and private access to one of the prettiest spots on the 100+ mile length of Lake Champlain. As part of our efforts to make the stay of our guests special we provide fine linens for our beds. There are three propane fireplaces. One is in the Music Room, the large entry room. One is in the Galley Room with its kitchen, HD TV seating and dining area. The third is downstairs. Refrigerator with freezer and ice maker. A second refrigerator in the lower level provides additional space for food, drinks and frozen items. In addition to a stove/oven there is a slow cooker adding to the variety of tools for the chef. Beautiful professional induction range from Bertazzoni. Faster & safer than traditional electric. In addition to a stove/oven there is a slow cooker adding to the variety of tools for the chef. Keurig coffee maker (K cups) Single serving french press. Wonderful Breville toaster allows over-sized artisan type breads. Slots are long enough for either 2 slices per side (four slices at the same time) or extra long slices. Other nice features. Along with dishes, cups and utensils there are a variety of pots and pans that will satisfy almost any sort of cooking you might do. Full kitchen with granite counter tops. Exceptionally positioned next to indoor dining, unobstructed, shared view of an HD TV, sweeping view of back deck, back yard, beach, dock and lake. There are 3 HD TVs. One in the Galley Room which allows viewing from the kitchen, the seating area there and the dining area. One is in the 1st floor mater bedroom. The third is downstairs. Satellite provides access to TV. Cable provides Internet access via Wi-fi network. Pleasant lawn slopes gently down to the water. There is also a separate lawn with seating and a hammock allowing for more spaces to enjoy with each other or to find some wanted solitude. 2 sit on top kayaks with paddles and life jackets and direct, easy access to the water. Use at your own discretion and risk. There is a golf course within a 5 minute drive from the house. Cell phone use at our home is enhanced with a booster for the Verizon network delivering a very strong signal throughout the house and around much of the property outside the house. There is a small cell tower for T-Mobil on the high ridge across the bay giving a good signal for those with that service. Our trip to Lake Champlain was made possible by booking this beautiful house. It was a house that exceeded our expectations. The sheer size was great enough to accommodate 8 adults, with plenty of rooms and especially bathrooms. Bets part was the open-concept of the kitchen and living room with the extra high ceilings, which gives a unique look. Plus the view of the majestic lake. Russ, the owner, was very graceful and helpful. Always helped us for nay questions and always showed such patience for every request. His character was as important as the condition/beauty of the property. Its highly recommended that you book this property. You won't be disappointed and expectations will be met. It has everything that a lake house has to offer. We had a great time. Lovely views, great area, warm comfortable home. This is a lovely spot on a bay of Lake Champlain. A great place to relax with a beautiful view. The lakefront property is very peaceful. Great place to swim, bike, and kayak. There is a big fire pit, hammocks and Adirondack chairs for relaxing. The large outdoor deck was a bonus. We stayed for the week of the 4th of July with our friends and kids. What a perfect spot! The house was plenty big enough to accommodate everyone and allowing everyone to have their own space. The yard and beach had the perfect amount of sun and shade all day long. Our kids loved being able to play in the sand on the beach. The mooring was perfect for our boat, and the dock allowed for easy loading and unloading. Beautiful sunsets and a great fire pit! House/property is 100% as advertised, no surprises! We would recommend this house to anyone looking to spend some time on Lake Champlain and we hope to go back soon. The homeowners met us at the house to show us around, were VERY easily accessible, and checked in once during the week to make sure everything was to our liking and we were having no issues, they truly want everyone to enjoy their beautiful home and property. One of our favorite vacations with our family and friends. My family and I were lucky enough to reserve this beautiful home at the last minute and the owner was wonderful accommodating us on such short notice. Everything was exactly as described, only better. The beds were extremely comfortable and the decor was charming and inviting. The fully stocked kitchen was great and met all our cookware needs. My brother fell in love with the awesome wood pellet grill and everything he cooked on there was top notch! The owners also have an extensive cookbook collection which our group throughly enjoyed.The TV's and three fireplaces were great spots to chill out at night, unless you were down at the fire pit on the lake roasting marshmallows. By day the lake was spectacular. We kayaked, fished and just relaxed. The occasion that brought us to Willsboro was my daughters' graduation from Champlain College. We took the nearby ferry on several occasions to attend the ceremony and sightsee in Vermont including King St. Marketplace and Ben & Jerry's ice cream. I have stayed in many homes in my life and this home truly had everything you could ever want and the owners were extremely accessible if you had any questions. There were also many extras supplied like beach towels, games and tea & coffee. All in all an amazing long weekend my family will never forget. Thank you Russ and May for opening your beautiful home. I highly recommend anyone visiting the area to chose this property, the owner was great to work with making my VRBO experience 5 star! Distance to Burlington, VT is about 20 miles which includes a ferry. Time to/from Burlington is roughly 50 minutes including the ferry. Rates are subject to change until reservation is confirmed. Most of the floors throughout the house are hardwood. In order to protect them from all the year round outdoor activity we take our shoes off immediately on entering the house, whether from the deck or the door. We ask all our guests to treat our home with the same care and respect.